Today was all about one man, Valentino Rossi. 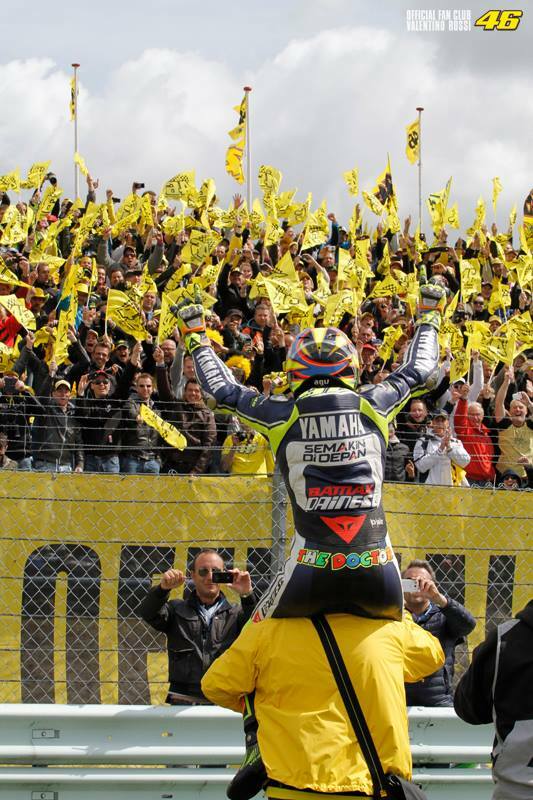 Valentino Rossi has won his first race in nearly three years, by winning the Dutch MotoGP in Assen this afternoon. The Doctor returned to the top step this afternoon, and it was the 80th victory in his MotoGP career, and his 106th of his grand prix career. He was joined on the podium by Marc Marquez and Cal Crutchlow. World Champion Jorge Lorenzo battled to a valiant fifth, just one place behind title rival Dani Pedrosa, despite breaking his collarbone in two places less than 48 hours ago. Cal Crutchlow started the race from pole today, and was the first satellite Yamaha to start from first since Ben Spies did it back in 2010 aboard the Tech3 M1 in Indy, but it was Dani Pedrosa who took the whole shot with one of the trademark fast starts from him. Dani Pedrosa stormed to the front, and was followed by Stefan Bradl, team mate Marc Marquez and Rossi, but Marquez quickly overtook the German, making it a Repsol Honda one-two. Rossi wasn’t in any mood to get held up behind the German as he was in Qatar, and swiftly moved through setting his sights on the Honda duo. Meanwhile further back Jorge Lorenzo had already moved into 7th position, up five places from his grid slot, and continued to move forward overtaking Bradley Smith and Stefan Bradl be the end of the third lap, by lap four Lorenzo was in forth place, ahead of Crutchlow, and setting his sights on the front three. Rossi went past Marquez and on lap five the Doctor passed Pedrosa in the fina chicane to send Assen into euphoria, from then on no rider would see the 46 on the front of Rossi’s back as he lead was never in any danger. “Today was something special, this is one of the best victories in my career because it is one of the most wanted and expected for such a lot of time,”said the Doctor. “I’m so happy because I won a real race where all my opponents were very strong and very fast, apart from Jorge with his injury. It was great from the beginning, I had a good feeling, I could overtake on braking and I felt good on the bike. It was difficult but the finish line was calling me so I had to arrive as fast as possible. Lorenzo caught right up with Marquez, and at one point looked like he was about to slip into third position with a look up the inside of turn nine, although he decided better of it. However fitness finally took it’s tool on Lorenzo, and at the half way point Lorenzo started to drop back from Marquez and into the clutches of Crutchlow. Crutchlow was cautious in overtaking the world champion, but eventually passed him into the final chicane. With just under 10 laps to go, Marquez caught Pedrosa, and decided to attack his team mate. After more than one close pass, Marquez eventually got the better of his experinced team mate, and set about catching Rossi, whilst Pedrosa had to worry about Crutchlow behind him. With just five laps to go, Crutchlow caught Pedrosa, and wasted no time in getting past the world championship leader. Crutchlow then set about catching Marquez who was faling further behind the now comfortable Rossi. Crutchlow caught Marquezwith just over a lap to go, however he couldn’t get past the rookie. Coming into turn one on the last lap Marquez made a mistake, and as a result Crutchlow had to run win, and was exceedingly lucky to stay up, but he was too far behind Marquez to come back now, having to settle for third place. Stefan Bradl was the best of the rest with another solid ride finishing sixth, just ahead of the other satellite Honda of Alvro Bautista. Aleix Espargaro will be an unsung hero of the day as he took eighth position, ahead of Bradley Smith and top Ducati Andrea Dovizioso who had a weekend to forget for Ducati. All 23 riders who started the race crossed the finish line this afternoon in the TT.